An undisclosed number of unlicensed parking lots have sprung up across Ho Chi Minh City, in front of crowded markets, hospitals and busy downtown areas, causing much inconvenience to pedestrians. The most disorderly scenes caused by unlicensed parking lots are around large markets in the city. Most parking lot owners deliberately encroach on the sidewalks, leaving no space for pedestrians to even walk. 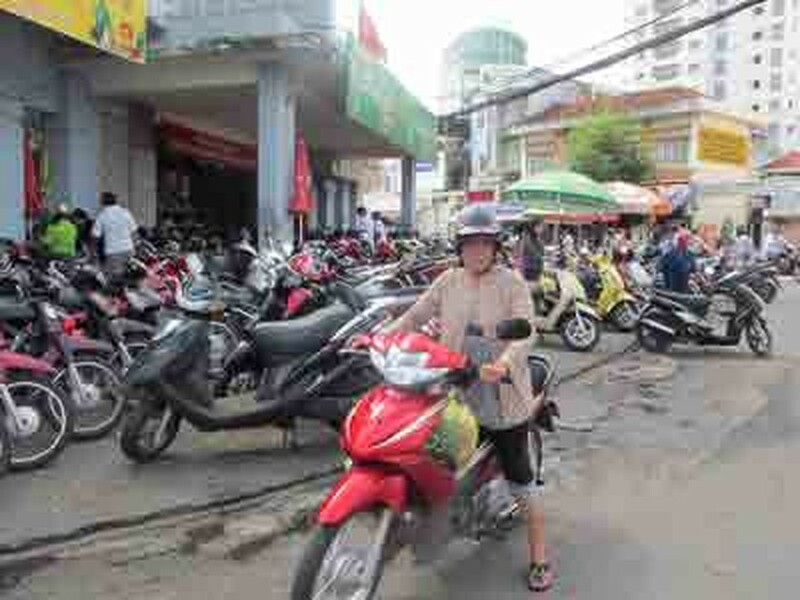 Right in front of the Management Office of Da Kao Market in Da Kao Ward in District 1, a parking area choked with motorbikes is blocking a large part of Nguyen Huy Tu Street. A quick look at the parking ticket shows the words ‘The People’s Committee of District 1,Ho Chi Minh City; Office of Finance, Planning and Investment’ printed on it with a row demarcating area to park your motorbike along with a printed ticket number. On the other side is printed the name of a certain senior lieutenant called Tran Van K. in red ink. 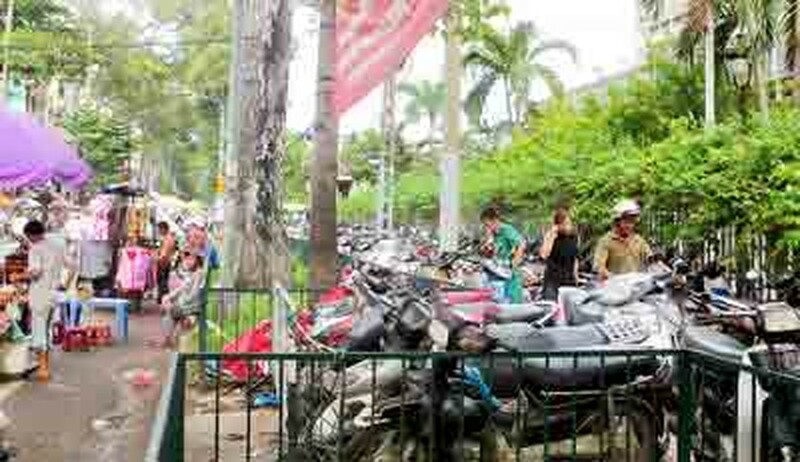 Similarly, a large parking lot with hundreds of motorcycles is occupying the curb of Nguyen Thai Binh and Cong Quynh Streets in District 1, for people going to Nguyen Thai Binh Market. On the ticket it says ‘Printed in accordance with model No. HCM 27/DT-A-10 GM2 … CV 1413/CT-AC issued 15 February 2006 by the Tax Department of Ho Chi Minh City, Price: VND2,000.’ However, all riders have to pay VND3,000 (about US$0.15) as the lot owner says that parking prices have increased! At Dan Sinh Market in District 1, there are at least three parking lots that are obstructing surrounding streets. It is remarkable how they continue to function under a sign saying ‘Residents of Apartment Complex 39 are determined to keep a clean residential area!’ In this very chaotic parking lot, owners are ripping off customers with a VND5,000 (approx. US$0.25) parking lot fee. Another chaotic example is the area around the popular Ben Thanh Market, were scores of visitors descend daily. The situation in the vicinity of hospitals is no less a mess. Take for instance the sidewalk on Nguyen Du Street in District 1, which is painted with markings for families of patients in Children Hospital No.2 to park. When in fact it has been occupied by a parking lot that operates around-the-clock with a hefty price fee of VND5,000. Pedestrians have to make do with maneuvering along traffic congested roads. Exactly in front of 214 De Tham Street is a large unlicensed parking lot, monitored by people working in Cong Nhan Cinema across the street. Another illegal parking lot is situated along the curb of Calmette and Le Thi Hong Gam in District 1, charging VND7,000 (around US$0.35). On the parking ticket of the Altaplaza Department Store, right next to the office of the security guards of the residential area and the sign ‘Hawkers are prohibited’, no price is printed but it says it is authorized by a certain ‘senior management’. Hundreds of motorbikes are parked on both pavements of Ton That Dam Street (near the newly-built Vo Van Kiet road), alongside tens of cars parked right on the street, paying a hefty VND5,000. In downtown areas of the city, many streets like Thai Van Lung, Thi Sach, Nguyen Sieu, Ton That Dam, Nguyen Cong Tru, etc. have illegal parking lots serving hundreds of bikers each day. The People’s Committee of Ho Chi Minh City issued Decision No.74 in 2008, on usage and management of pavements and roads in the city. Accordingly, local authorities are allowed to temporarily organize public parking lots so that business activities in busy areas are well organized. One and a half years later, related offices and organizations in the city proposed detailed plans of parking lots on specific streets. As per this regulation, 63 streets in District 1 are now allowed to operate government-managed parking lots, which strangely are still not operating, while unlicensed parking lots are flourishing.